A sport facility built brick-by-brick by East Los Angeles residents in 1928 received landmark status from the State Historic Resources Commission on Aug. 3. The commission’s approval of the nomination means the Maravilla Handball Court and El Centro Market are now listed in the California Register of Historical Resources, according to Jay Correia, State Historian for the California State Parks Office of Historic Preservation. The site was nominated last year by the Los Angeles Conservancy in partnership with the Maravilla Historical Society, and had the formal support of the Los Angeles County Board of Supervisors, according to Los Angeles Conservancy Director of Communications Cindy Olnick. Olnick said not every commissioner attended the meeting in Beverly Hills, but all those in attendance voted for the listing. There was no opposition to the listing from attendees at the meeting, she said. “Listing in the California Register offers preservation protection for the site by making certain changes to it subject to public review under the California Environmental Quality Act (CEQA). Since the property is located in unincorporated East Los Angeles, which does not have a preservation ordinance, state-level designation currently offers the strongest protection,” Olnick said in an email on Monday. About 10 members of the community and the Maravilla Historical Society (MHS) attended the meeting and spoke in favor of the nomination, according to MHS President Amanda Perez, who grew up in the Maravilla neighborhood. “It went excellent, it was just overwhelming,” Perez said. The commission staff’s presentation on the Maravilla Handball Court and market “emphasized the Mexican-American community and how this location has the support of the community, and how multi-ethnic groups have gone through here,” Perez said. 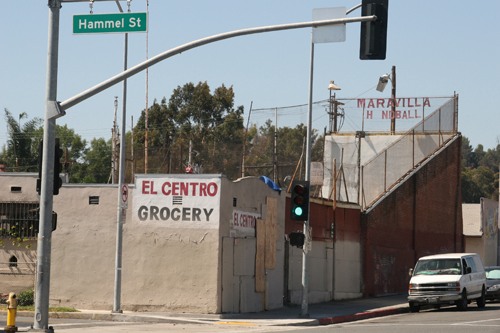 The Maravilla Handball Court, located at 4787 Hammel St., was built by East LA residents in 1928; El Centro Grocery store and an attached residence were built in 1946, according to the Los Angeles Conservancy website. Michi and Tommy Nishiyama took over management of the property in the 1940s and later became its owners. Michi came to the Maravilla neighborhood in East LA following her internment in a Japanese relocation camp. She would host community Christmas parties and other social activities, and was loved for her acts of generosity, which included giving residents a line of credit at El Centro Market. 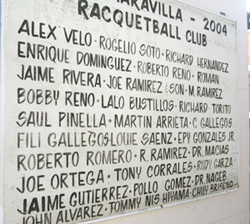 The handball court was home to the men’s-only Maravilla Handball Club from 1928 to 2007. After the Nishiyamas passed away, in 2006 and 2007, the court and store were closed and boarded up. In 2008, Perez and the Historical Society undertook efforts “to restore the court and store for community residents to appreciate, use, and learn about an important part of their neighborhood’s history,” according to the Los Angeles Conservancy. Today, Perez says she personally wants the site to be used as a place where children can learn to play handball, and as a community center where local residents can go for other activities, such as bingo for seniors. “Michi would have loved that, she was totally community involved and her heart was in the right place,” Perez said. The Maravilla Handball Courts, market and residence were recently listed for sale by Century 21, West Coast Brokers of Arcadia for $290,000. Real estate agent Joseph Nung declined to comment on the sale. The current property owner could not be reached for comment on the property’s new historical status by time of publication. The Los Angeles Conservancy supports any adaptive reuse of the site, according to Communications Coordinator Shannon Ryan, who noted that as a historic resource, any proposed development would trigger environmental review. Perez, said the historical society wants to purchase the property and has been negotiating with the owner: “He’ s been working with us and has been extremely supportive,” she said, but added they do not want to hold back a sale of the property if a buyer comes forward. Perez said landmark status means it is unlikely the site will be knocked down, adding that it will be preserved as a place where for young people can be empowered by their history and understand their future. Preserving the handball courts will give East LA youth self-esteem and hope “that things can be done,” she said. Perez said the historical society’s goals also include formally becoming a non-profit organization and applying for grant funding for programming. Small events are currently held at the handball courts; donations are used to pay for bills such as lighting and maintenance, she said. The El Centro market was damaged in an electrical fire in December.